Meet Angel. She lives very happily with one of our RWA members, April, as you can see in the video, and her new husbun, Ricky. A few months ago, she used to live alone in a tiny hutch. It was filthy and stinking. The roof leaked. 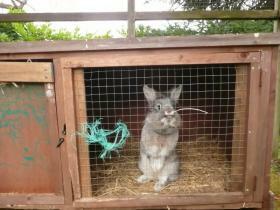 The hutch was exposed to all types of weather, including blazing sunshine, and her owner had it covered in a tarpaulin because of the leaks, but that was left down over the front of the hutch hour after hour after hour so Angel couldn’t even see out, nor get any fresh air, nor relief from the rank odour of her hutch. April rescued her from that, and now Angel is showing us all what sort of life a bunny ought to have and how joyful, playful and fun they can be http://youtu.be/zJjyHmn3YKY Ricky is equally lucky. He was found wandering the streets around his home town. He’d been someone’s pet but had either escaped or been dumped. He was brought to April by the lady who found him. Adverts were placed to try to help him find his way back home, but his owner never came forward. No one was looking for Ricky, or missing him. Luckily he has a great and a safe, secure life with his Angel. This is how Angel lived before – not good is it?